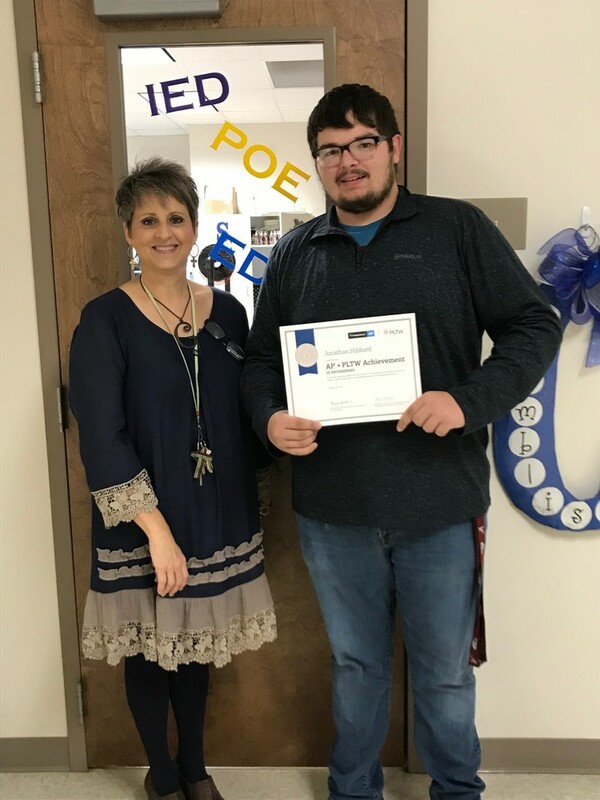 Star City High School student, Jonathan Hibbard was awarded the AP & PLTW Achievement in Engineering for earning qualifying scores on a combination of three Advanced Placement Exams and Project Lead The Way End-of-Course Assessment in the Engineering pathway. As a senior, Jonathan was the first student from Star City to be recognized and awarded this achievement. Jonathan has taken five Advanced Placement courses: World History, United States History, Language and Composition, Literature, and Biology. Courses in the Engineering pathway that he has taken include: Introduction to Engineering, Principles of Engineering, Civil Engineering and Architecture, and Engineering Design and Development. PLTW teacher Ginny Chambliss is very proud of Jonathan’s accomplishments. “Your creativty, I have enjoyed watching. And I cannot wait to see what you do with your future. You know, you were good in Engineering but whenever you make those Inventor files you come alive. You put everything into them. It just shows me that your creativity is on a higher level”.